When I tell people that I wrote a hiking guidebook for the Chicago region, their first question often has do with the whereabouts of local hikes with hills. When I get this question, I often direct people to the Indiana Dunes, the Palos/Sag Valley Forest preserve in southwestern Cook County, and Chain O’ Lakes State Park in Lake County. If people ask for advice on hilly road biking routes in the area, I find myself on shaky ground. I let them know that I’m in the process of researching a biking guidebook for the Chicago region and have yet to explore many of the local road biking routes. After that disclaimer, I’ll mention possible routes in McHenry County and even more options further north into Wisconsin. Now, I’m happy to report, I’ve discovered a scenic road biking destination relatively close to Chicago that has a fair number of hills: Barrington. Given the bustle of the suburban landscape surrounding Barrington, I was utterly surprised with its rural atmosphere, and found myself congratulating the Barrington residents who fought to preserve their wooded hills, their sprawling marshlands, and widely spaced farms and houses. 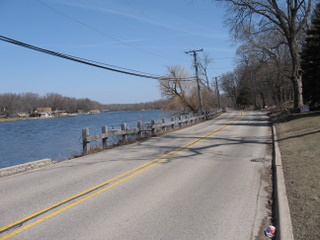 One of the highlights of the ride was following River Road—a wavy ribbon of asphalt that parallels the wide and mighty Fox River outside the town of Algonquin. River homes with big porches and inviting yards line the sides of the river along this road. Another highlight of the ride was pedaling alongside Spring Creek Valley Forest Preserve—4,000 acres of densely tangled woodland, tranquil prairie, and reedy marshes active with birds. Interrupting the savannas and the wetlands are oak- and hickory-laden hills, some of which are steep enough to shift into the granny gear. Mixed in with the woods and open space are horse farms, scattered houses, and the occasional lavish estate. If you know the area, you know that Barrington is not the average upscale suburb. While average-sized houses do exist, many of the dwellings are better described as mansions, country manors, or in some bizarre cases, castles. If you live in Chicago or some of the adjoining suburbs, Barrington is a snap to get to on the Metra. I started from the Metra Station in Fox River Grove on the Union Pacific District Northwest Line. Some of the roads that were best for cycling were North River Road, Spring Creek Road, Bateman Road, Penny Road, Old Sutton Road, and Otis Road. Many of these run through or border Cook County Forest Preserves. The full ride description and map will appear the Best Chicago Bike Rides, to be published by FalconGuides. 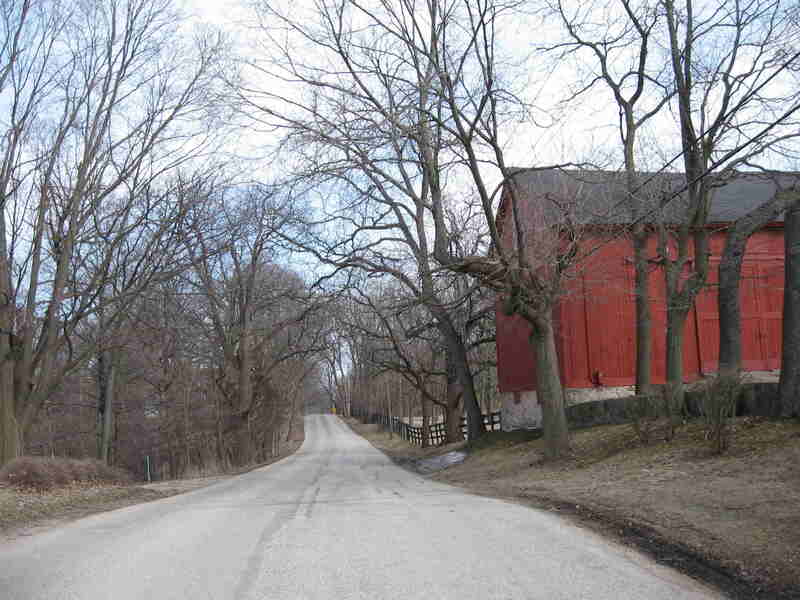 This entry (Permalink) was posted on Friday, May 23rd, 2008 at and is filed under Biking, Chicago area. You can follow any responses to this entry through the RSS 2.0 feed. You can leave a response , or trackback from your own site. Prairie Fever is powered by	WordPress 3.5.1 and delivered to you in 0.184 seconds using 35 queries.